Apparently, in the almost eight years that Hubby and I have known each other, at no point did it come up that he dislikes marshmallow! I hadn't known at all when I happily showed him the S'mores I made from scratch, beaming with pride. Out of the entire batch, he picked up the one with the smallest piece of marshmallow, and upon sampling it, declared that it would be a great treat- sans the blue stuff. (I thought it would be great to dye my homemade marshmallow a light blue to add a 'whimsical quality'... but alas, it went unappreciated!) lol. Anyway, when I set out to make these graham crackers, I envisioned them being tiny, bite sized crackers, similar to teddy grahams. They were my faaaavorite when I was a kid and boy, were they delicious dipped in melted chocolate! But, there was only one problem: I didn't have cookie cutters small enough! Then I remembered that I had some decorative pie dough cutters from Williams Sonoma! They come in a box of four and are about 1 inch in diameter. 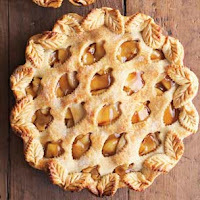 I use them all the time for my pies...but I can't seem to find one of my own pictures, so here's one from the Williams Sonoma website. They used the leaf cutter to make this apple pie, isn't it cute?! You can even see the veins on the leafs! When you flip them over, you can see the detail that each cutter makes. I especially love the star and the leaf because they give you the most detail. The star cutter makes three little star impressions in the center! They are su per easy to use and way better than your usual, run-of-the-mill cookie cutters. They conveniently have a spring on the back that does two things: (1) it pushes down to make the cute detailed impressions (2) once you cut through the dough, the cut-out "gets stuck" in the cutter, making it super easy to transfer to where you want to put it. It pops out easy once you push down on the spring again. This makes is so that you're not trying to lift the tiny, delicate piece of dough off of your surface, which can cause it to rip or distort in shape. Unfortunately, I can't find it online on the WS website, but I've seen them everywhere in WS stores, so be sure to check it out next time you're there! 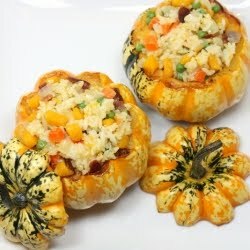 This is what it looks like before going into the oven. Surprisingly, the detail stays pretty clear, even after it's baked. I noticed that the thinner the dough, the more likely the design will stay after it's baked. You want these to be thin anyway, to give it the crunchiness of teddy grahams. 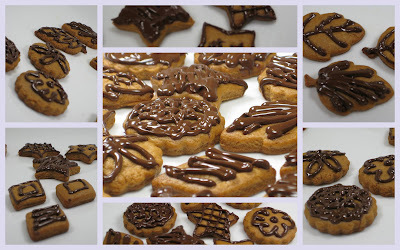 Once cooled, I melted some dark chocolate chips, put them in a ziplock bag, and pipped on some cute designs. Chill in the fridge for about 2 hours. This will both harden the chocolate and the crackers. If you eat them right away, you will still get a bit of the soft, right-out-of-the-over cookie texture. After a couple of hours in the fridge, they should have a nice crunch to them. They turned out to be super crunchy and delicious, just like chocolate covered teddy grahams, but better! Yum! Nick and I went camping this weekend and had s'mores (not homemade). When I got home, i wanted more (ha!) so I "roasted" a marshmallow over the gas stove using a skewer! It gives it a nice toasty flavor! I must say that I'm awfully jealous of all your kitchen accessories! They all look so fun! BTW - what size piping tip do you use for your cupcakes? no need to be jealous, bryn. the only reason i have so much cool kitchen stuff is because of the wedding, and since you have one coming up too... ;) wedding registries are pretty awesome! i use a standard star tip to ice my cupcakes. i don't know what number it is off the top of my head.. i got it in a set of 5 tips, great for a beginner! i'll look it up for you when i'm at the home store later this week and get back to you! PS - your mom was right!